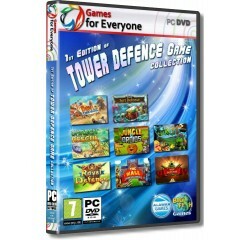 Tower Defence Game Collection Vol.1 - 8in1 - R120,00 : Game Hunt, Where we lead, others follow. #1 Day D - Time Mayhem -You've tripped into history and fallen straight into prehistoric times! Hordes of powerful dinosaurs present a constant threat to your time machine. Just one rogue reptile could render your machine useless and ruin your chances of ever returning home! But to be armed with knowledge is to be armed and very dangerous. Build towers, collect resources, and use the power of science and technology to win the uncompromising battle for survival of the species! Find out who's stronger - the technology of the future, or brute force! #2 Fort Defense -Welcome to the unique pirate-style tower defense. Now the battle rages on by land and by sea! Take part in an uncompromising struggle repelling freebooters' assaults. Watch out, the enemy may catch the tide and ruin your fortress. Build towers, collect crystals, upgrade spells and believe in your victory in Fort Defense! #3 Garden Rescue - A serious menace has approached the peaceful garden and you must help defend it in Garden Rescue! As masses of voracious insects rush to fill their maws, the garden-inhabiting plants lay aside their everyday jobs to save their tiny motherland. Command the defenses, lead the green defenders into action and rescue the garden from impending doom! Earn coins, upgrade your garden, place more plants. It's all in your hands! #4 Jungle vs Droids - Don't mess with the jungle! Help the animals defend magical crystals from invading alien droids in Jungle vs. Droids! Strategically place and upgrade your animals to defeat malevolent robots in this unique, colorful and humorous tower defense game! #5 Orczz - Protect the Kingdom of Whiteleaf from an invading Orc Horde in Orczz, a fun and exciting Strategy game! Whiteleaf is world renowned for its delicious honey wine and now relies on you to protect their delicious mead from the terrifying Orczz. Command the brave Knights of the Order of the Mug against the legions of villains and save the day! Master minigames, unlock achievements, and command tons of different units in Orczz! #6 Royal Defense -The castle needs a hero - hordes of trolls are surrounding it! Build towers, save money, learn spells, and keep the enemy away! Follow the exciting story of the dwarven kingdom's eternal struggle against the troll hordes, who want only to crush the dwarves and claim their territory. To defeat these monstrous hordes, you must construct defensive towers and units and learn to wield powerful spells. Tap anywhere you like for a handy pop-up menu listing all the units and structures that can be built in each location. Tap existing structures to see how you can upgrade your forces with powerful improvements! All your towers and units have specific stats: Damage, Fire rate, Damage radius, Damage type, as well as various other features, such as Enemy Slowdown and Damage Over Time. Each level also brings new units and structures to help you fight the troll menace. You'll never be lacking for new and exciting ways of decimating those nasty trolls! #7 The Wall - Medieval Heroes -In The Wall: Medieval Heroes, defend your village, which is besieged by aggressive, jealous barbarians! Discover a new game genre that combines tower defense and resource management. Keep an eye on your villagers, who will gather the resources you need to create your army behind the wall, and deploy your units strategically in front of it! With a wide variety of units, towers and traps to choose from, you will have to find the best ways of diverting, slicing, exploding, poisoning and incinerating an infinite army of aggressive enemies. Recruit mortars, archers, powerful cavaliers, crazy saboteurs, terrifying warriors and shifty assassins, and stand fast! All hell is going to break loose in this rural idyll, with 8 villages and 7 game modes that you can play and replay as you wish! #8 Toy Defense -Test your courage and skills as a military leader at the height of World War I in Toy Defense, an exciting Tower Defense game! Don't let enemies get to your base! Help toy soldiers survive through attacks, protect your base from enemy airplanes, tanks, airships and overcome unexpected traps with the help of different kinds of weapons. Earn stars, strengthen your towers, improve soldiers and buy upgrades. Victory is in your hands!